The only thing that should scare the Western Conference more than the Rockets 31-point blowout of the Oklahoma City Thunder in the series opener is the way in which they won that game. Possessing arguably the best offense in the NBA, the Houston Rockets averaged just over 115 points per game, a total nearly 10 points per night higher than their total from last season. The way in which the Rockets won over 50 games this year through their unique ability to run away with a game with a barrage of three pointers was well documented and has kept the rest of the contenders in the West on their heels. However, nothing should scare the rest of the playoff teams more than the idea that the Rockets shot poorly for the majority of game one, turned the ball over, and still blew the Thunder out enough to give Bobby Brown some playing time. Now, if you only watched the fourth quarter which consisted of James Harden hitting three pointers at will with a smile on his face, stop reading. Sure, Harden had 37 points and Eric Gordon eventually got hot. As usual, both of these guys helped the Rockets out greatly. However, their shooting was nowhere near the reason the Rockets won this game in the fashion that they did. In game one, the Rockets beat the Thunder at Thunder-basketball. Oklahoma City came into the game as the leagues top team in both rebounds and points in the paint. The Rockets walked into game one as arguably the best three point shooting team this league has ever seen. The Rockets didn’t just start off slow from the arc, they couldn’t make a shot. Harden went 0-6 from three (1-7 from the field) in the first half, while Anderson, Ariza and Lou Williams went the entire game without hitting a three. The Rockets still somehow managed to go into the second half up five, a lead that was too close for comfort for Houston fans. The way in which the Rockets adjusted their game in the second half is the reason I look at them as the Warriors top threat in the West. The Rockets outrebounded the best rebounding team in the NBA, which led to a 27-point difference in second-chance points. The Rockets ended up shooting just over 30% from three for the game, so they changed their second half approach to scoring and eventually outscored the league’s top scoring team in the paint 62-38. They didn’t hit 20 threes, they didn’t shoot 30 free throws, but the Houston Rockets turned a poor shooting night into a 30-point playoff blowout against the little ninja turtle that will probably be hoisting the MVP trophy in June. After the Rockets dropped nearly 140 points in the last regular season matchup between these two teams, mostly due to Oklahoma City’s inability to figure out how to stop James Harden off the screen, the Thunder changed up the way they defended it. Rather than leaving Roberson on Harden at the top of the key off a screen and avoiding a mismatch in the paint, the Thunder chose to allow their big man stay on Harden off the screen, knowing that a mismatch in the paint was less of a threat than Harden being wide open for more than a second. This was part of the reason the game remained so close in the first half. Harden would have a one-on-one with Kanter or Adams off the screen, but after an 0-6 first half, he realized that at least for tonight, three-point shot wasn’t the answer in that situation. In the second half, we saw a different James Harden. The guy who deserves the MVP showed the Oklahoma City Thunder why no one can finish in the paint or find the open man better than he can. Harden became a monster in the paint, finishing nearly every contested lay-up opportunity and putting Enes Kanter on skates on a crossover for the ages. When he couldn’t get the shot he wanted, he found Capela or Nene, two average big men that Harden has morphed into premier paint guys. Harden has single handidly transformed Capela into a solid post presence while revitalizing the career of Nene. All Russell Westbrook did was make Steven Adams the second most hated man on the Thunder. Capela finished the game with 14, Nene had 15, and the Rockets scored on 9 out of Harden’s 10 assist attempts. Ryan Anderson, the Rockets’ wingman who helped this team all year with his ability to make it rain from three, went 1-6 from the field last night. Why am I telling you this? Because he led the team in +/- with a +27. This Rockets team, contrary to popular belief, can win a basketball game in many different ways. Finally, here’s to the guy I’ve been raving about for three years. The best defending guard, most underrated player and the guy who knows how to get under your skin like the bacteria from a Motel 6 shower, Patrick Beverley. Bev got my vote for the MVP of game one. His shot isn’t always on, but boy was it on the other night. His 21 points; however, were meaningless compared to his aggressiveness on the boards and ability to make Russell Westbrook insignificant in game one. You can’t expect anyone to fully shutdown Russ, but Beverley got arguably as close as anyone has besides the referee in Memphis who gave him the double-tech back in December. Westbrook turned the ball over 9 times, one away from another one of his coveted triple doubles. It got to the point in Houston where the stat comparison up on the big screen wasn’t your two MVP candidates. It was Beverley and Westbrook, clearly in favor of the 6’1 firecracker out of Arkansas. So, long story short, the Rockets won a playoff game in which Harden started the game 1-8, neither Anderson, Ariza, nor Lou Williams made a three, missed 8 free throws and turned the ball over 11 times as a team. This is their fair warning to the rest of the league: you better hope the Rockets do a lot of things wrong if you want to beat them in a seven-game series. 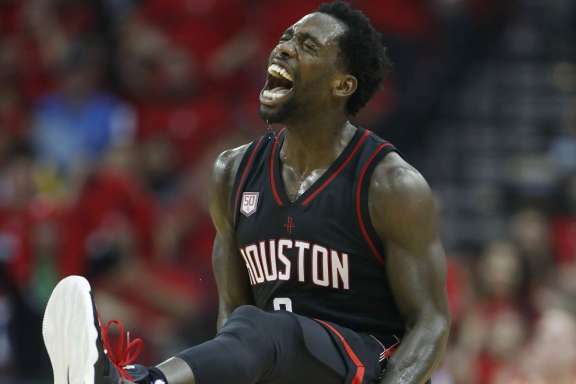 While rebounding, inside scoring and Patrick Beverley helped the Rockets plunge through game one, don’t be surprised when you see them win if they get killed on the boards but knock down 20-plus threes.